U.S. intelligence has concluded that an audiotape of Osama bin Laden broadcast last week is real and was recently recorded, providing the first evidence in almost a year that al Qaeda's leader is alive, officials said Monday. The audiotape, broadcast on an Arab language television network, does not appear to have been altered or edited, suggesting it is what it sounds like: bin Laden himself, reading a prepared statement promising new terrorism against the United States and its allies, said one U.S. official, speaking on the condition of anonymity. The analysis of the tape was performed by technical experts, linguists and translators at the CIA and National Security Agency, who compared the message to previous recordings of bin Laden. They are as certain as they can be that it is genuine, the intelligence official said. Because it mentions recent terrorist attacks, officials concluded it was made in the last few weeks, the official said. U.S. intelligence had not received any definitive evidence in a year that bin Laden had survived the U.S. attacks on Afghanistan after Sept. 11. The tape gives little clue to bin Laden's location or his health, officials said. Although his whereabouts are unknown, CBS News Correspondent David Martin reports that U.S. intelligence believes Osama bin Laden is hiding in the remote border area between northern Pakistan and Afghanistan. Technical analysis of the audiotape supports that belief, but as with every other piece of intelligence about bin Laden's whereabouts it is neither specific nor current enough to nab him. Sources tell CBS News that the tape was transmitted over a phone line consistent with the quality of phone connections in Pakistan and Afghanistan, but there is no way of knowing where in those two countries the phone was located. The message also was a determining factor in a new spate of terror alerts in the United States and elsewhere last week. Previous public statements from bin Laden have served as preludes to terrorist attacks, officials said. 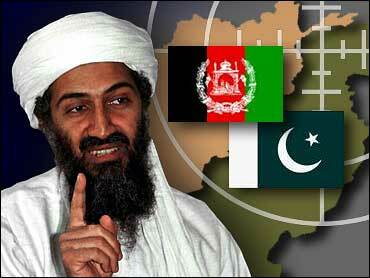 American officials have never confirmed rumors that bin Laden was wounded or suffering some kind of kidney ailment. The speaker on the tape appears to refer to the killing of a U.S. diplomat in Amman, Jordan, on Oct. 28, the most recent event noted in the transcript. Whether bin Laden or al Qaeda had a direct hand in the attack is unknown, U.S. officials said. The speaker also praises several more terrorist attacks by suspected Islamic militants between April and October, including the bombing of a nightclub in Bali, Indonesia, on Oct. 12, that left close to 200 people dead, and the Chechen takeover of a theater in Moscow, in late October. Previously, the last certain evidence bin Laden was alive was recorded on Nov. 9, 2001, when he had dinner with his chief deputy, Ayman al-Zawahri, his spokesman and others. A videotape of the meal was recovered by U.S. forces in Afghanistan and later aired internationally. Late in December, another tape of bin Laden giving a statement aired. He appeared gaunt and possibly wounded. The references in the tape suggested it was filmed in late November or early December, but officials could not be certain. On Dec. 10, in the Tora Bora area of Afghanistan where bin Laden was believed to be hiding, U.S. personnel intercepted a radio transmission that was believed to have come from the al Qaeda leader. But it was not recorded and never matched against his voiceprint, U.S. officials have said. U.S. intelligence has confirmed several tapes released earlier in 2002 to have come from bin Laden, who is believed to have led the Sept. 11 attacks on New York and Washington that left some 3,000 dead. However, those tapes gave no reference to recent events, and provided no confirmation of whether al Qaeda's leader was still alive.